What to know, steps to take, things to focus on when buying your first home. First, I applaud you for making the decision (at least in principal) to join the ranks of the “equity enhanced”. I say in principal because many people “decide” to buy instead of rent, but when it get to the point of going beyond thinking about buying and making actionable steps to buy, some waver, get dissuaded or give up on this dream. This is not as easy as it seems. For the most part, this means deciding to take on the responsibility to pay for and care for your own home. Sure, you pay rent somewhere and have experience that level of responsibility. Sure you pay utilities for where you stay probably, but paying the “house fees” in their entirety is another thing all together. Some wish to decide if NOW is the time. Some of the questions you consider: Should you buy before getting married? Am I ready for the responsibility? All of these are valid and definitely worth considering. Once you have decided to buy as opposed to renting or living with family or friends, the adventure really begins. STEP TWO: How will I buy ? The First family, Jen and John First have decided to buy a home, they have decided to take the step to build equity and add to their personal value. They immediately call up their uncle Jim Agent to begin showing them houses immediately. They hear that now is a buyer’s market and there are “great deals” on homes. Excited to begin, Jim shows them houses on consecutive weekends and after the 8th property, the ninth was the charm. They love it. It has just enough yard, a patio and updated baths and kitchen. The middle school is two blocks down and the neighbor’s home are meticulous. “Can we write and offer on this one Uncle Jim? I really love this one. I think it is our home. I can feel it.” Jen said excitedly. Agent Uncle Jim reluctantly replies, “I am so sorry puddin’ before I submit the offer, I will need you to get a pre approval for a mortgage company or mortgage broker. I will give you a number to a banker but he will have to approve you.”. During the time it took for Jen and Joh to touch base with, to submit their information to, and to get a preapproval from (which is not always guaranteed), the Sellers of their dream home accepted an offer from the Pre’pared family. Jen and John, especially Jen never really recovered and were hesitant to put any other offers in on homes thinking they missed their dream home. Once you have talked to a banker or mortgage broker and obtained a mortgage pre approval, you will have an understanding of your price range so you can “go shopping”. I said, “What you would concede to pay,” because one thing that Real Estate agents know is that ALMOST EVERYTHING IS NEGOTIABLE including price and other factors. Of course you cannot move a house, but you can request particular items to be done OR that you be compensated or credited for them. For example, gas appliances instead of electric might be as important to you as it was to my wife. Solution, we asked for a seller’s credit to convert the dryer leads and stove to gas. We received a credit at closing and payed our plumbing contractor (King Cobra Plumbing) to run gas lines and to run water/ice lines to the fridge while he was at it. Many things are negotiable but you have to keep in mind it is NEGOTIATED. In other words, we can request it, but they do not always agree to it (at least the first time). Bottom line: choose your most important factors and as you take time to make that list, stick with it through your house buying experience and do not sway. Friends, family, co-workers, and even houses themselves will try to change your mind. Stay focused with what was/is important to you. STEP FOUR: I FOUND IT ! You walk in and you found it. You have found your dream home. It has 90% of everything you need plus some things you were amazed to find it included. You talk to your agent and tell him you think you are ready and this house is it. NOTE: There are some important factors that often your mortgage banker or Real Estate agent don’t explain in enough detail until after you have found your home and are ready to make it yours. That is the CLOSING COSTS. Closing costs are the costs and fees associated with the purchase of the house. They are generally connected to items like transfer taxes, mortgage fees, real estate taxes as well as other fees associated with th purchase of real estate. When you are ready to sign an Agreement of Sale (this is the document you send to actually offer your price and terms to the seller), your agent (and mortgage broker) is also required to send you a Closing Costs Estimate. Transfer and Recordation Taxes. In Pennsylvania transfer taxes are 2% of the sales price for BOTH SIDES. In Montgomery County it varies but usually 1%. Title Insurance. This insurance protects you and your mortgage provider from any defects in title which crop up after settlement. The details of a title insurance is an article on it’s own. I find that 0.4% of the purchase price is a good estimate. Prepaids and Escrow. Escrow accounts to pay for future property taxes and insurance will be setup. The amount of property tax that you’ll pay at settlement depends on the timing of settlement. Loan Charges. I typically see around $700 for an appraisal and $600 for underwriting and document preparation. However, this can vary widely by mortgage providers. When comparing different loan programs, don’t simply compare the total closing costs estimated. PMI: This usually only applies when you have an FHA or possibly a VA mortgage. This is the charge that the government charges (both a lump sum at closing and a monthly fee in the mortgage payment) to offset their ability to allow a buyer to put only 3.5% down payment as opposed to the traditional 10-20%. A bit more complicated but this is the gist of it. 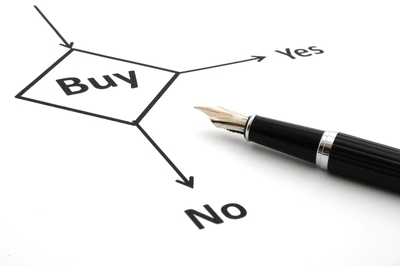 Sellers Assist: If sellers assist is given, then it is notated on here and credited to the buyer at closing. Sometimes a fixed amount, sometimes a percentage of the sale price. Sellers Escrow Deposit: This is the deposit(s) you give both at the time you submit the offer and usually 14 days after the offer was accepted. This money is to allow the buyer to put “skin in the game” to show their interest in the property. It is also to allow the seller a deposit for removing their home from the market. If, the buyer “backs out of the deal” for reasons not related to their contingencies (we can talk contingencies later), they will get this money. Otherwise, it stays with the buyer (but held by the Seller’s agent company) and they receive credit for this money at closing. 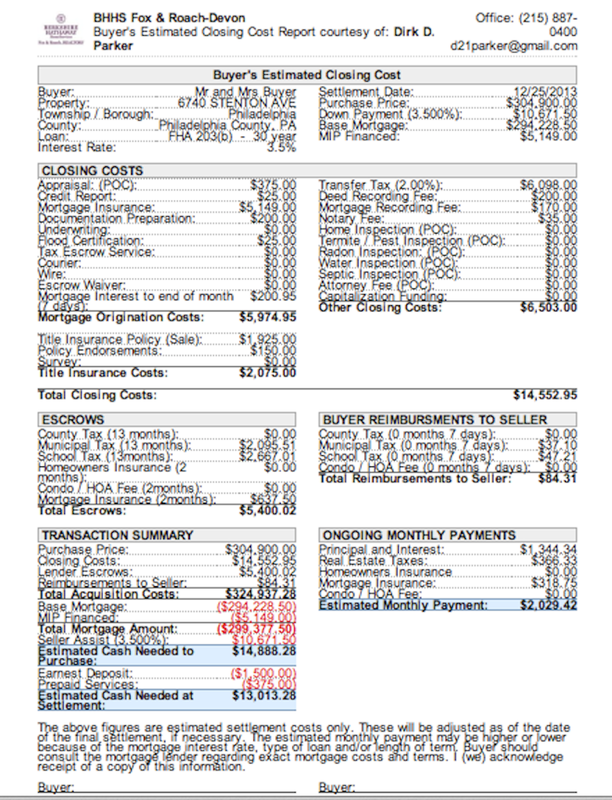 The important components of the closing cost estimate are the AMOUNT DUE AT CLOSING and THE MONTHLY MORTGAGE AMOUNT. The amounts on this estimate from your agent are just that, estimates. They contain the fees that the agent is aware of. Generally, the fees charged by mortgage companies vary so the Closing Cost Estimate from your agent is generally accurate but not exact. This estimate (along with the Agreement of Sale) must be signed as part of the paperwork to ensue YOU, the buyer understands the costs associated with the purchase of your home. STEP FIVE: Your offer was ACCEPTED! NOW WHAT? Your agent calls you and “Congratulations, your offer was accepted”. Now I am of two minds in these terms. If your offer is accepted, the Agreement of Sale is not EXECUTED until the Seller’s agent has the actual check as well as signatures of both the Buyer (you) and Seller held by both Buyer’s agent and Seller’s agent. I only truly congratulate clients when I have the executed (signed) agreement in my possession. Now, a lot can still happen after this time where either Buyer or Seller can back out but the ball is in the court of you the Buyer and as long as you understand that “everything is a negotiation”. I have an entire post about this part of the process so I will not belabor it. Just a few important tips. As I said before, again most everything is negotiable. Also as a buyer, understand that home inspectors are paid to find issues and at times almost feel that they did not earn their money if they do not “find” issues with a house. Make sure to take your agent with you if possible to the home inspection because sometimes it may scare you right out of your dream house. You might leave the home inspection saying “Wow, I thought this house was n great shape. I am not sure I want this one, seems like a money pit.” Usually this is NOT true at all, it just may seem that way from your perspective. Material defects are the only items to be concerned about. Everything else can generally be repaired and/or negotiated favorably by the knowledgeable agent and buyer. But do choose your home inspector wisely. I put this as seven but actually this happens simultaneously AFTER the Agreement of Sale or “AOS” is “executed” or signed by both buyer and seller. The banker or mortgage broker will ask for the AOS, and many, many, many … many other documents from you in order to get you your Mortgage Commitment. This Mortgage Commitment is the REAL confirmation to your mortgage approval. Within the commitment, you will know your interest rate, your monthly payment and many of the other important details you will need to know. Consider the Pre-approval- Mortgage Commitment process similar to those pre-approved credit card letters you would receive in the mail shortly after turning the legal age to be responsible for your own finances. For some it came when they first began working, for others it was like sophomore year at college. The letter said’ “Congratulations, you are approved for a Capital One Credit Card”. I requested you to sign and send back the form with Name, SS# and a few other things. What you may not have known is that they “Pre-approved” you based on preliminary information obtained about you (unsolicited). Now as you sign the letter or call and give consent, they really dig into your financial situation and later send you the card with all the details like your APR, your credit limit and all the other legal items contained. This process is like that, the Pre-approval you get from your banker or mortgage broker is just that, a “Pre-approval”. It is definitely more than nothing (that is why sellers now require a buyer to have one), but in order for the bank to lend you the large sums of money it takes to purchase a home. They have to know a “bit more” about you. I do not want to spoil the surprise but you will be copying and emailing all sorts of thinks. Why? well because there are a group of people that are the “Gatekeepers of the loans”. They make sure that everything you gave, checks out and that what you make is what you make, what you have is what you have and what you spend is what you spend. It will seem like they do this “Checking” for their sheer joy or watching you suffer, but they are THE UNDERWRITERS and they check everything. Basically, your bankers asks you for all that stuff to satisfy them THE UNDERWRITERS. Be warned, but you will be fine. This is sometimes underrated. There are a few things that you need to work on while waiting for the Mortgage Commitment. The mortgage underwriter WILL monitor your accounts up until the day of the closing. It is important NOT to make any big deposits OR withdrawals beyond automatic deposits and withdrawals that are common in your account. DO NOT DEPOSIT large amounts of cash or family member checks, even if they are helping you with the purchase. If you ARE receiving a “gift” of money from a family member, make sure you get a gift letter from them and they WILL have to provide a ban statement showing the money in there and showing where it was taken from their account. Otherwise, secure movers, figure and coordinate rental agreement cancellations and all other utility and logistics loose ends to tie up. Usually on the same day or within a day of each other, both are important. The Final Walk-through is important because as you walk through the house before you are actually the owner. Everything that needed to be done, cleaned, trimmed, swept, or repaired should be completed or you have a few options. Back out of the sale: usually without penalty especially if all the conditions were not met. Ask for an adjustment at closing to cover what was not done. Accept the property in this condition. Closing: During closing the documents you will need are your Driver’s License, and a pretty sturdy writing wrist. They will need to make sure you are who you are. You will also need to sign many documents (most of them relate to the mortgage) for the deed and mortgage documents. Mortgage companies require a great deal of paperwork because it is their money and they want to make sure nothing stands in their way to get it back. WELL, this is about the long and short of buying a house. Even in this form, there are still things I have left out for time. Read, reread this, look at the videos and please fee free t ask me any questions. I have the answer. Posted by dirktherealtor on December 5, 2013 in Uncategorized.